This is the complete log of SimplyHelp projects and activities that occurred during the year 2002. SimplyHelp helped 80 children from less fortunate families to celebrate Christmas in Los Angeles and Majestic Village by donating food and gifts. SimplyHelp volunteers helped load donations into two containers. A 45-foot container with 10,000lb. of rice, dry food, canned food and clothing. A 40-foot container of 7,000lb. of rice, dry food, canned food, clothing, shoes and toys. Freight to Honduras was financed by Mrs. Teresa Chang, Lydia and SimplyHelp. Freight to Salvador was financed by Toy Store in Los Angeles. 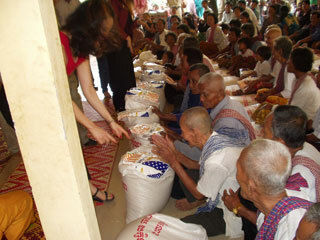 Rice donated by h.k.b., Dou family, Wang, Shen, Peng and Huang Families. Dry food donated by Big Lots. Simply Help’s San Jose Branch officially established. 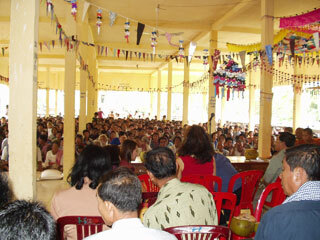 The Cambodia Vocational School sponsored by SimpleHelp celebrated her first graduation. 50 student graduated from the computer class. Hopefully they can get a job with what they have learned in school. The scholarship and celebration expenses were donated by Tina Bow. Led by the graduates of Cambodia Computer School, the principal and SimplyHelp volunteers, Tina and Serena went to Fam Pong Speu and delivered 50 kilo of rice to 175 families, and a set of kitchen ware to another 200 families. In the past 3 years Cambodia has been recovering from its civil war. People still live in hunger, and many young children have to work to survive, they often don’t have the chance get educated. The death rate in Cambodia is very high. Rice was donated by Tina. 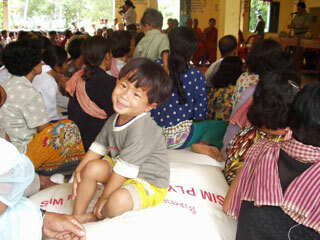 SimplyHelp delivered 15 tons of rice and 600 bottles of detergent to the people of Kam Pong Cham in Cambodia. SimplyHelp’s volunteers hearts were bleeding when they saw hundreds of thin children running without clothes and shoes, and took out money and put them into the children’s litte hands. Because of recent flood and draught, the people in the village are in hunger, SimplyHelp only could provide 50 kilo of rice and one bottle of detergent to 600 families in the village. Tina, Serena and Hay Yang delivered the donations. Rice was donated by Dou, Wang, Shen, Pend and Huang family. Tina and Serena traveled to Cambodia at their own expenses to asses the need in villages and deliver the donations. Tina Bow was invited by Fa-Ing temple to share with children the happiness of giving. Tina told the children that there are a lot of children at their ages that are not as fortunate as them, and encouraged them to donate part of their toys and used goods for the needy children. SimplyHelp volunteers together with the volunteers from Chinese American Service Alliance spent more than three hours sorting and packing clothes for later shipping. A SimplyHelp volunteer whom is a Korean doctor and a priest loaded three vans full of food and new clothes and delivered it to the people in the remote village of Mexico and Peru. Foods was donated by Kim-Lan food corporation and clothes was donated by Tsai family. Because of natural disasters, the people in Honduras have suffered tremendously. More than 20 volunteers spent hours to pack 17,000 pounds of rice, canned food and clothes to 45 feet container to help people living there, wishing that they will have a better winter. Rice was donated by Dou, Wang and Shen family. Canned food was donated by Kim-Lan food corporation and local temples. And shipping fees was donated by Teresa Chen and Lydia’s family. The Mario family drove a full truck of food donated by Big Lots to the people in Ensenada of Mexico. 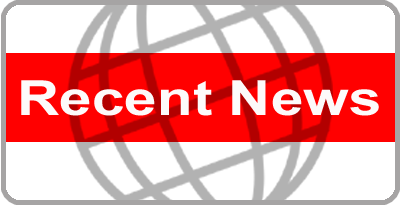 08/11/02 Click Here To See A Press Clipping For This Event! Due to the draught and civil war in Somalia, the people in this region suffered a great deal. The volunteers spent 5 hours to pack 10,000 ponds of rice, dry food, milk and canned food and shipped a 45 feet container to Somalia to relieve their suffering. Rice was donated by Dou’s family, food was donated by BigLot and Rashid helped to deliver the donations. With help of volunteers from west side of L.A., SimplyHelp sent a full truck of food to the people in remote area of Mexico. Mario was responsible for delivering the donations. Hong Kong Supermarket in the City of Industry donated a booth, so SimplyHelp will have a permanent place for people to donate goods. The vocational school in Cambodia scheduled 3 computer classes. Each class can have up to 20 students, and each term will last 6 months. Currently there are 60 students enrolled in the computer training. Many immigrants living on the west side of Los Angeles struggle in their daily lives and are in desperate need. SimplyHelp delivered more than 10 boxes of clothes and canned food to Cambodian immigrants. They were all extremely grateful to receive the donations. The vocational school computer class in Cambodia starts today with 15 students. The principal of the school is a volunteer who is also in charge of the Japanese Buddhist temple in the area. SimplyHelp attended a carnival in the City of Industry, celebrating Mother’s Day. Volunteers wore brand-new uniforms with SimplyHelp logo. This two day event was sponsored by Hong Kong Supermarket. SimplyHelp raised $411.50 for its SimplyHelp Fund. The uniform was donated by Dou’s family, and the toys were donated by Mr. David of Preferred Plush. A 40 feet container with food was shipped to Cambodia to relieve the difficulties village people were facing. Cathy Pan was there to deliver the gifts. The computer class for the vocational school in Cambodia will start mid-May. The sewing class will start at the beginning of June. SimplyHelp was invited by Soka University in Irvine to celebrate the school’s anniversary. A booth was set up, and SimplyHelp sold gifts, and $510.00 was raised. The material to set up the booth was donated by Alice Lin, and the gifts were donated by Ingrid Chen. Local merchants have donated clothing material and sewing machines for Cambodia to SimplyHelp . Charter Oak High School donated a set of computers and a telephone system. A 45 feet container containing these supplies was shipped to the vocational school in Cambodia. The vocational school in Cambodia, sponsored by SimplyHelp, will open in May. Volunteers are working very hard to collect the needed teaching materials. With the donation of $13,200 by Tina Young, Tina Bow, Dou’s family and Mrs. Toung, SimplyHelp was able to ship a container. The shipment included computers, printers, sewing machines, tables, and desks. In response to a request made by the ambassador of Cambodia, a 45 foot container of food, clothing, and medical supplies was shipped to poor villages in Cambodia. The freight was transported by Ultimate Freight. 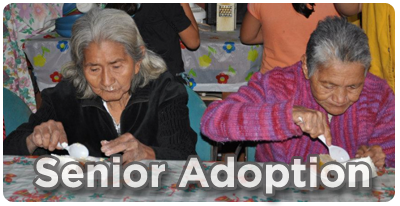 01/09/02 Click Here To See A Press Clipping For This Event! With Henry Dou’s assistance, SimplyHelp and a Korean church shipped a 40 feet container of canned food donated by Pic & Save to a remote leprosy island village called Sorodo, located in Korea. This island’s nickname is "Cursed Island", because nobody cares about the people suffering from leprosy whom live on the island, including the government. This donation is the largest gift received by the community in 85 years. It was truly appreciated. Tina and Serena visited Cambodia, and return with good news. SimplyHelp has been approved to enter the United Nation NGO program. Cambodia donated a piece of land to build a vocational training center.